If you’re looking for the best denture adhesives trusted brands have to offer this year, look no further. Our article was put together after all the proper research was done so you can have access to some of the most effective options right now. We went through expert adhesive reviews, honest opinions from past and present buyers and selected those products that meet all the highest quality standards. We’ve also compiled a buying advice list that will actually make a difference. One product that stood out is the Fixodent Extra because it helps the denture stay in place all day long, it is easy to apply, and because it has a nice texture that won’t irritate you if you have sensitive gums. Additionally, it makes sure your breath won’t smell like chemicals. 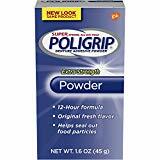 If you’re looking for an alternative in case this product is out of stock, the Super Poligrip Powder can be just as effective in helping you enjoy food more. Formulated to keep your dental replacement in place and rid you of any fear that it might fall off, this non-toxic product promises to provide all-day protection. This means that you won’t have to reapply it throughout the day. You just need to apply a thin layer in order to enjoy an airtight seal and prevent food from getting between your gums and denture. It can be used for both full and partial dentures. At least one customer says the product has an unpleasant lasting flavor. Easy to apply and containing no toxic ingredients, this product is worth considering if you want an airtight seal. Free of any artificial color that could stain your teeth, this powder is another product you might want to pay attention to. The improved formula is zinc-free and promises to provide an all-day protection so you can rest assured that your dental replacement won’t fall off when you go out. It has a fresh flavor and creates a seal that will prevent food particles from entering between your gums and denture. One buyer says the product is oily and it is hard to get off fingers. Keep your denture in place and create a seal that won’t allow food particles to build up with this 12-hour formula. Committed to providing you with a tight hold and a fresh breath, this denture adhesive has no artificial colorings or flavors and promises to kill harmful germs that cause bad breath. Moreover, it will help you seal out food particles that can lead to unpleasant taste and smell. It can be applied with ease given the fact that it comes in a can of cream. The Precision Tip Nozzle will help you apply the right amount. Several people who tried it say the product lasts only a few hours. If you want an easy-to-apply and efficient denture adhesive, this formula might be what you need. Down below you have a list where you can find the best adhesive for dentures, a list with options that buyers and reviewers recommended. Each product is formulated from ingredients that won’t be unhealthy in the long run, so you can rest assured that no matter what you pick, your back will be covered. Furthermore, you have a diverse palette of shapes and forms to choose from. Living with a dental replacement is a hard thing on its own, so to simplify things, let this adhesive help you out. It is a strong, non-toxic product that will help you smile a lot more often because it will eliminate your fears. Additionally, it provides all-day protection so you won’t have to repeat the applying process throughout the day. A thin layer is enough to provide an airtight seal, which will prevent food from entering between your gums and the denture, and will also prevent bacteria buildup. The product is actually a light powder, and it is easy to apply, even if you have shaky hands or poor eyesight. What’s even better about it is that you can use it for full and also partial dentures. Because the product is not harmful in any way, many dentists recommend it for those who want a complete solution that is both efficient and fuss-free at the same time. Another powder that will offer a great deal of help when it comes to attaching your denture is this improved product. The first thing you should know about it that it has no artificial colors that could stain your teeth or even start an allergic reaction. You could use it on a daily basis without thinking about side effects. It also features a zinc-free formula, and it provides an all-day hold so you can leave your house and go to dinner without fearing your denture will fall off. The seal it creates will deny access to 74% more food particles so that you won’t get irritated or end up with an oral infection. Consequently, this powder is efficient and significantly improves comfort and satisfaction. It also contributes to the stability of your denture while you’re biting into something that requires a lot a force, which is a challenge for many products in this category. If you want a denture adhesive that helps seal out food particles as you’re enjoying your meals, this an excellent fit for you. The product combines a tight hold with a fresh breath throughout the day by killing those germs that usually cause bad breath. Plus, the Precision Tip Nozzle it comes with, offers you the control to apply just the right amount. The manufacturer says that its formula is enhanced with special ingredients which are 5X more efficient in their mission. It will allow you to enjoy things like corn and sweets without having to worry about painful gums or about the denture acquiring a bad smell. Fixodent has no artificial flavors or colorings, and the fact that it comes in a can of cream means you can apply it with confidence, without making a mess. All of these perks make it a great weapon against denture malfunctions and a daily ally that you can rely on. What you should know about this popular product is that it has an improved recipe which is now preservative-free. Additionally, if you like products with extra-long holding powers, you should note that it works for at least twelve hours even if you eat three meals a day. The elderly will also appreciate the fact that it is suitable for both full and partial dentures and oral irrigators as well. As a stamp of quality, the product is manufactured in the United States, meaning all of the state-imposed standards will be respected so you can get an item that is safe to use. To remove the adhesive is even simpler now. Just use your toothbrush! Another benefit is that you won’t have to wait too long for the cream to dry after you’ve applied it – only fifteen minutes and you’re ready to enjoy a full-course meal and even warm drinks. Everyone who has to struggle with dentures will appreciate this product. It makes the whole thing less uncomfortable without having to compromise on the type of food you eat. The adhesive is zinc-free, and it will provide an all-day hold and its signature peppermint-spearmint flavor too. It has a natural feel to it, and if you use the right amount, it won’t ooze from between your sensitive gums and the denture. Specialists formulated the product to offer a hold that will last up to twelve hours and to give the dentures stability as you’re chewing on solid food. Because it comes in a twin pack, it means you won’t run out of adhesive anytime soon. Thus, you won’t waste precious time by placing another order and waiting for it to be delivered. Plus, the brand is one with experience so that you can put your faith in it. If you’re tired of wearing ill-fitting dentures, this will soon become your solution to holding them in place. The recipe features no zinc as the newest health standards recommend, and it comes with a subtle flavor and a good texture. All of these features make it a suitable choice for those who like a high-quality adhesive that offers the full package. It is suitable for long-term use, and it will keep everything in place for many hours in a row. If you are not convinced, maybe the fact that it has the American Dental Association seal of approval will get you interested in it. It will be gentle to your gums, and to remove it from the denture it’s a clean and straightforward process that only requires warm water and a brush. Another great selling point is that you can order six at a time as a guarantee you will have your back covered. This is an adhesive that will generally last all day and which is easy to clean up. It has a lovely texture and flavor, and the chemicals inside are not harmful to your health. Furthermore, the wafers come in a convenient package, ideal for secure storage and use. The product has a zinc-free recipe, and it doesn’t ooze like some other types of adhesives in this category do. You also get a great value for your money because it packs plenty of wafers for you to take advantage of on a daily basis. Because the 30-piece box is so convenient, you can always carry it with you even as you’re traveling abroad or if you need a quick fix before dinner with your friends and family. This will also help you avoid an unpleasant experience, as it can be easily cleaned from your denture and it won’t erode it even if you use it regularly. Corega is one of the most well-known denture adhesive brands out there. And for a good reason – they offer quality products like this one. It is an original cream, which comes in a pack of three, and it’s also part of the brand’s range of zinc-free denture adhesives. It is formulated to offer you a reliable, all-day hold with an extra burst of minty flavor to improve your breath throughout the day. Corega Fresh comes with the guarantee that it will seal out more food particles than the market’s average, so food won’t get underneath the dentures to cause damage and bad smells. Only short strips of cream are necessary to hold your dental replacement in place, and this user-friendliness makes it great for seniors who have weakened muscles or shaky hands. The removal procedure is just as simple, as all you are required to do is rinse your mouth with warm water. There are many kinds of dentures, so the first thing this guide will teach you is to go for an adhesive that is universal, to help you avoid problems like discomfort or bacteria buildup, which can give you bad breath. Additionally, look for things like a smooth texture, a minty flavor and of course, that all of the product’s ingredients are safe for oral use. Paying attention to valuable information, details as well to the pros and cons of certain denture adhesives for sale can be beneficial in choosing the perfect product for your needs, so do not skip this step. If you respect these guidelines, you can find products that can be awesome and cheap gifts for grandparents. Ingredients – this should be the number one thing that pops into your mind when you think about a good denture adhesive or anything else that enters your body, like good and indispensable osteoporosis treatments. Many of today’s top adhesives contain the infamous mineral zinc. Zinc has benefits, but too much can cause nerve damage. Additionally, it is possible that you can even overdose from a cheap denture adhesive that contains zinc. Paying extra attention to this particular ingredient is very relevant, notably since the market features plenty of options for you that are zinc-free and just as helpful in keeping the denture in place for a long time. Price is not important when it comes to a good adhesive for dentures, but you should make sure you do not overpay for something inefficient. However, because your oral health is at stake, you should not avoid paying a premium price for something that reviewers say is working. The same applies when you buy healthy and diverse senior multivitamin too. Denture adhesives come in many sizes and weights. Typically, you should orient yourself towards something that offers the best bang for your buck. To do this, you have to look for an adhesive that contains many ounces per tube so that it can last for weeks, just as if you were to look for an inexpensive laxative for the elderly that works. Additionally, some smart manufacturers bundle many adhesive tubes into one package, so you can avoid buying the product multiple times, especially if you are the type of person who uses the denture on a daily basis. This also means that you’ll get a better price because buying multiple items means you save on delivery and on waiting times. 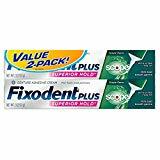 But if you are on the other side of the spectrum, going for something that offers multiple packages might be wasteful, reviews of denture adhesive mention. If you belong to this category, one tube of adhesive should be enough. This can be true even if you want to buy adhesive as thoughtful and unique grandma gifts. The Food and Drug Administration has more information in regard to zinc and its risks and on what to do if too much enters your body. The site also has other lists with ingredients that can be unhealthy, if you want to educate yourself on the topic. We also think you should check out the blood pressure lowering supplements section for more inspiration. While wearing dentures may not be ideal, it is the only option for many seniors, reviews of denture adhesives also tell us. That’s why you need an adhesive that can last for more than ten hours. Something that lasts less might be a burden since you’ll have to reapply it regularly. Also, dentures are most of the time very expensive, so you want your adhesive to protect their integrity and not to be corrosive. This is another thing that will make sure your gums will stay healthy, as there are plenty of products that do more harm than good. If you want another thing to help out with old age, invest in a soft and durable mattress for the elderly. There’s no point in emphasizing that these products are a vital part of denture care. Moreover, you should also consider the toothpaste you opt for to clean your dental replacement, denture adhesives reviews tell us. Make sure it specially created to be used with dentures and that it contains antibacterial elements.